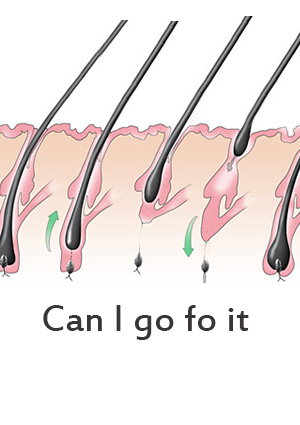 On an average, the minimum age to undergo hair transplantation is 25 years, as then it is possible to know clearly the manner of balding, its characteristics, its extent etc. However this is not a rule and if the balding is localized, we can do hair transplant at an earlier age as well. There is no upper age limit for hair transplant. Depending on the grade of your baldness, Dr. Gaurav Garg plans your treatment. Those patients, who have already undergone hair transplant by FUT method before, should choose our BOOSTED - FUE for the best results. At Dermalife, The hair transplant in South Delhi is done in very comfortable and relaxing atmosphere. A consultation with Dr. Gaurav Garg can clearly detail you with who can go for Hair Transplant and the suitable procedure for you.